Growing up, there were two things I really hated doing: sitting in the cramped backseat of the car and yardwork. Growing up as the middle of five children, there were two things I frequently had to do: sit in the cramped backseat of the car and yardwork. I would occasionally… okay, more than occasionally, try to argue my way out of both with my father. "Can’t someone else mow the lawn this time?" I’d ask, "It’s so hot outside." Or, "couldn’t someone else take a turn in the back? It’s just so uncomfortable back there." His response was invariably the same: "you could use a little less comfort in your life." I hated that phrase. It took me a while, but eventually I came to understand what he meant by it. If I’d never mowed the lawn or done yardwork I would have missed out on valuable lessons concerning hard work and getting your hands dirty. Comfort, while enjoyable, is dangerous in excess. Unfortunately my generation has made comfort their ultimate goal. This is to blame for why so many young people flocked to Bernie Sanders and continue to view socialism so positively. As a rising sophomore at college I bear witness to my peers’ devotion to comfort frequently, displayed even in the smallest of ways. The Silicon Valley drone style encapsulated by Mark Zuckerberg has become de rigueur for millennials. On college campuses many students can’t even be bothered to dress up that much. More and more students show up to class in sweatpants, sometimes even pajamas. Millennial style isn’t just casual anymore, it’s become downright lazy. Millennials also seek comfort in their dining. A study performed by Gallup found that while millennials have a lower level of obesity than other generations, their eating habits are the worst. Really: they forgo fruits and vegetables for less healthy options. A Harris Poll study showed that at 58 percent, millennials are more likely than any other generation to eat comfort food when stressed. Additionally, the Gallup study showed that a larger percent of millennials smoke and drink than the other age groups. But the desire for comfort exists beyond just the physical. Microagressions and trigger warnings exist because of college students’ excessive need for emotional comfort. Any material that makes students "uncomfortable" should, in their view, be banned to protect their emotional well-being. That censorship and force are required to create the limited worldview necessitated by the safe-space culture is of no concern. With college students so willing to achieve comfort regardless of the cost, it should come as no surprise that they found Bernie Sanders so appealing. 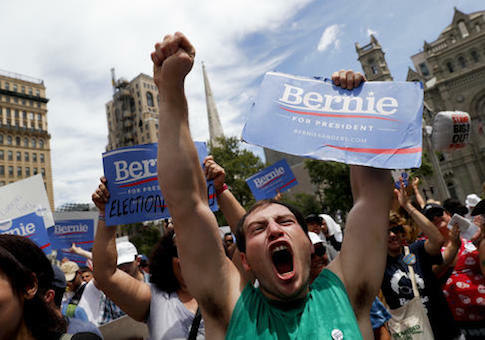 A whopping 69 percent of millennials would vote for a socialist and millennials view socialism more positively than capitalism. The promises of free college and free healthcare sound so enticing to a group that’s made comfort their main goal in life. Making comfort your life’s objective is a dangerous quest that yields disastrous results. While not currently obese, experts are concerned the eating habits of millennials will result in future obesity once their metabolism slows down. And the annual "Stress in America" survey performed by the American Psychological Association showed that, despite their best efforts, millennials feel more stressed out than any prior generation. Immediate gratification doesn’t pay off in the long run. And while the promises of socialism may seem appealing now, history has shown that, just liking skipping your veggies, it will backfire. It’s a hard pill to swallow, but we millennials could use a little less comfort in our lives.